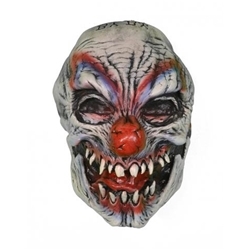 Includes one Funny Bones Clown Halloween wall art decoration of a scary clown face. Measures 10" tall by 5.5" wide. Colored as pictured. The funny bones wall art Halloween decoration is an easy way to turn your home into a haunted house for Halloween by creating the look of a scary clown face mounted to the wall. Made of lightweight plastic with a mounting hole at the top of the decoration. Please note that this is not a mask and cannot be worn like one.